Pasta is a quick and simple dish that feeds a crowd and pleases the masses. 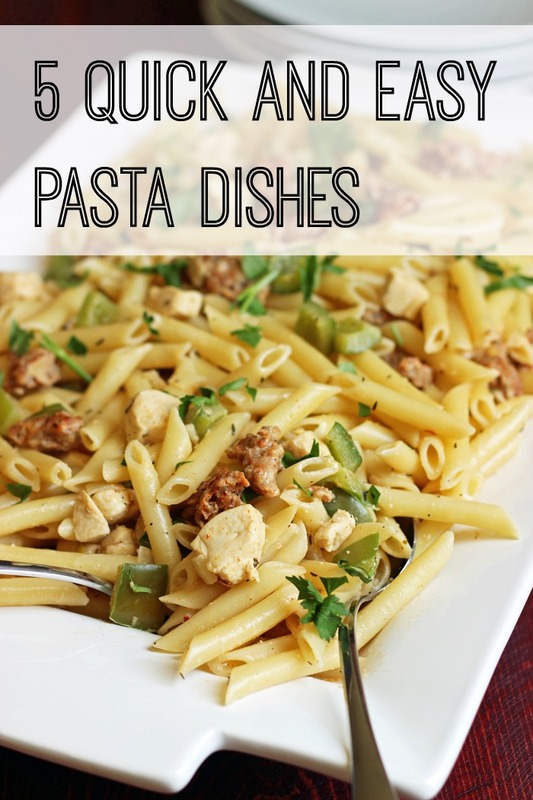 Check out these 5 quick and easy pasta dishes next time you need a little inspiration. Pasta is probably by far and away, one of my family’s favorite dinners. Seriously, like buttered noodles with parmesan makes them happy. I don’t really have to do much to pasta to make them happy. In fact, a couple of them are still in the stage where they just want me to leave it alone. I typically stock up on jumbo packages of Costco’s organic noodles. At about $1/pound, they are a great way for me to feed my family something quick and easy that they absolutely love. In fact, I made pasta for my husband on our first official “date”. I stood there in my college apartment kitchen, yacking away at the stove, when I watched his jaw drop and eyes bug out. I was making spaghetti, and like my mother before me, I broke the noodles in half before I dropped them in the pot. While he never paid this price, these are the noodles FishPapa bought as a bachelor. Ha! He was used to eating 2-foot spaghetti while I had broken mine down to 4-inch bits. Suffice it to say, I’ve been making pasta for the Fishers for a long time. Here are some of our favorite pasta recipes that come together quick and easy. 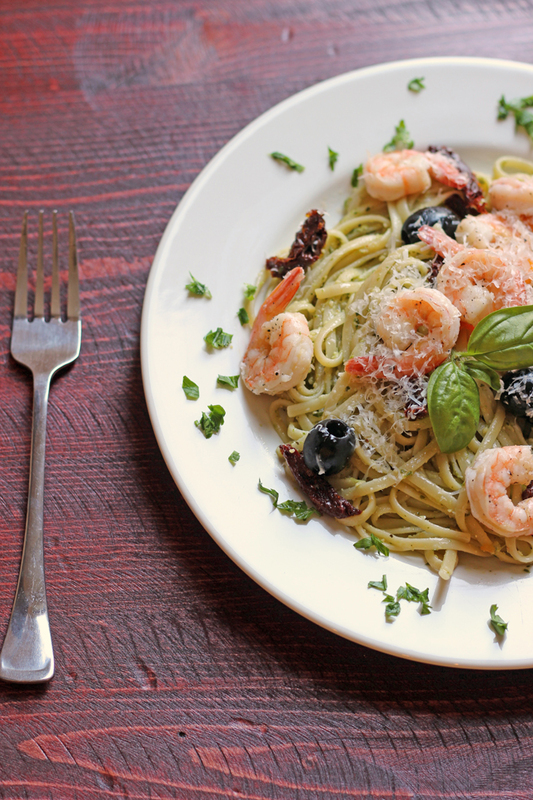 This Pesto Shrimp Linguine Salad is much like one that I served as a waitress back in my newlywed days. I love the combination of pesto and shrimp and slivers of sundried tomato. This “salad” is great served warm or cold, so you don’t have to wait to chill it. 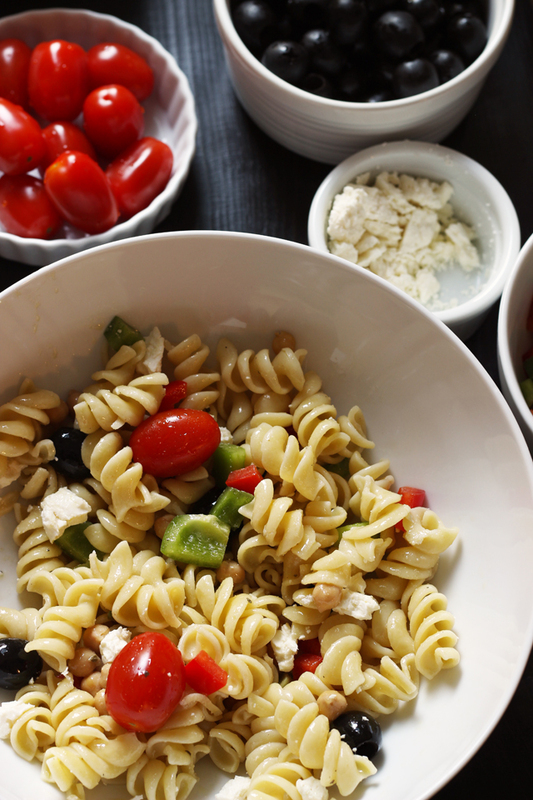 A Pasta Salad Bar pleases my plain-pasta people. Everyone can doctor up their noodles however they like. I lay out a variety of toppings and let them go to town. Mom of the Year, I tell ya. 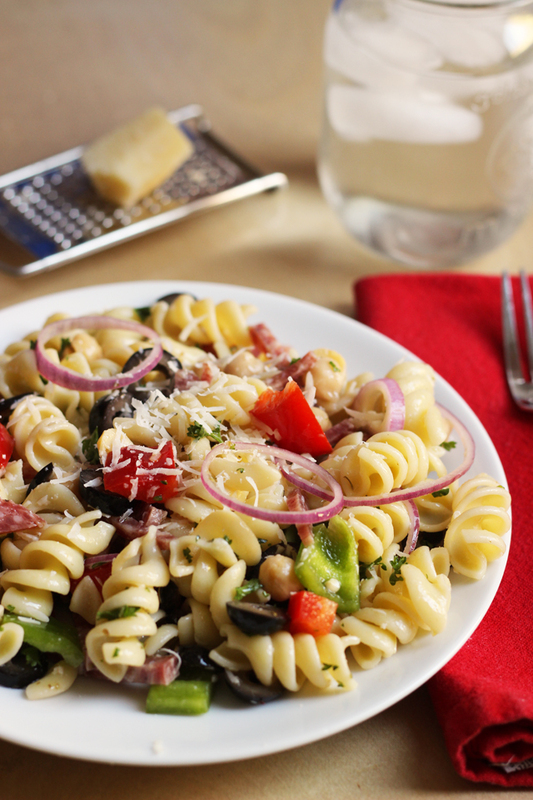 I love this Antipasto Pasta Salad for all its rich flavors: garlic, salami, onion, olives. Yum! This is a great make-ahead dish that comes together in minutes. It packs well, so it’s ideal for lunches and for meal gifting. This Tomato Brie Pasta is one of the easiest on the planet to make. It’s an upscale mac and cheese that takes just minutes to prepare. It’s grown-up food. Make the kids regular while you and your main squeeze enjoy this pan all to yourself. Pasta has clearly played a big roll in my marriage, now that I think about it. 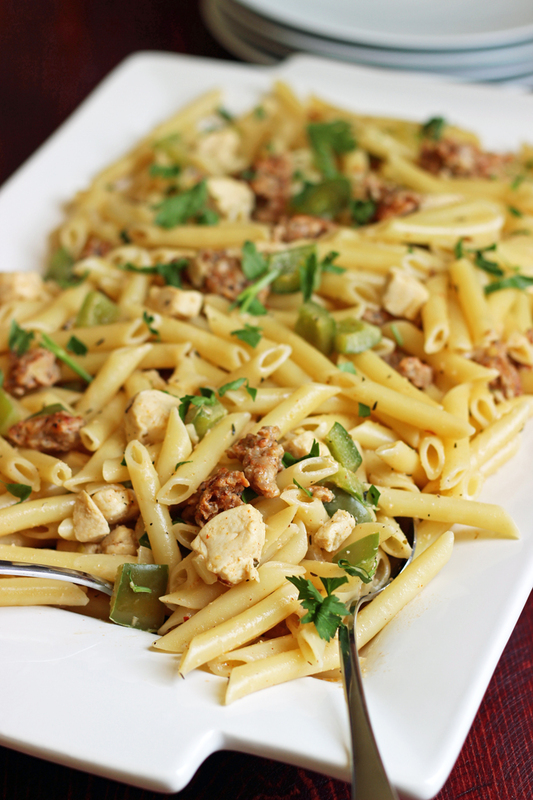 This Jambalaya Pasta with Sausage and Chicken is a recreation of one of my husband’s favorite restaurant dishes. Ever. It’s part of my new cookbook, and it is a hit with all our friends and family. My sister keeps texting me how much she loves it, so I figured I better give you a peek at it. You can make it as spicy as you like — so feel free to adjust the seasonings or the style of sausage to suit your preferences. Pasta: it’s a beautiful thing. It’s cheap. It’s quick to make. And there’s a way to dress it up to suit almost anyone and everyone. It definitely ranks near the top of our list of favorite quick dinner ideas. 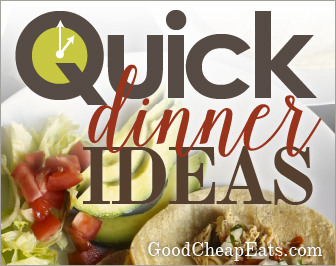 Don’t forget to read the whole series: Quick Dinner Ideas. We love pasta too and the many ways to make it. It would be impossible for me to decide which is my favorite. Of course pasta with any kind of red sauce, i.e. meatsauce, marinara, with meatballs and sausage, etc. will always be at the top of my list. But there are so many other ways that we enjoy pasta and one of them is called Chicken Tetrazzini. Cook spaghetti till al dente. Drain and set aside. Heat oven to 350. In a large soup pot type of pot over medium heat, sautee mushrooms in butter until tender. Reduce heat. Stir in flour. Cook 1 minute until smooth and bubbly, stirring constantly. Gradually stir in chicken broth. Cook over medium heat until mixture boils and slightly thickens, stirring constantly. Remove from heat; stir in half and half, parsley, salt and pepper. Add chicken and cooked spaghetti; toss with sauce. Pour into an ungreased 13×9 inch baking dish. Sprinkle with parmesan cheese. Bake at 350 for 30 to 35 minutes or until heated through. To make this extra quick, purchase one of those rotissieri chickens in the store. This sounds perfect this weekend. It’s suppose to be cool with a chance of rain here in NW MO so I think this will be a nice dish to warm up to. I might be able to get my husband to hang our outdoor Christmas lights before it gets too cold and nasty if I have this in the oven. Thanks for the recipe. Several of my family’s favorite pasta meals are associated with fond loving memories. For our first Valentine’s Day I made seafood pasta for my husband and I. We had been dating about 6 months, we didn’t have much money and a date night was out of the question. I remember that dinner costing me about $12 which included shrimp and scallops 13 years ago. My husband was thrilled and this meal has become our Valentine’s Day tradition. Even if we have date night funds, we still opt for this meal. There have been many variations over the years depending on the budget. Pasta Vodka is the other special family meal. 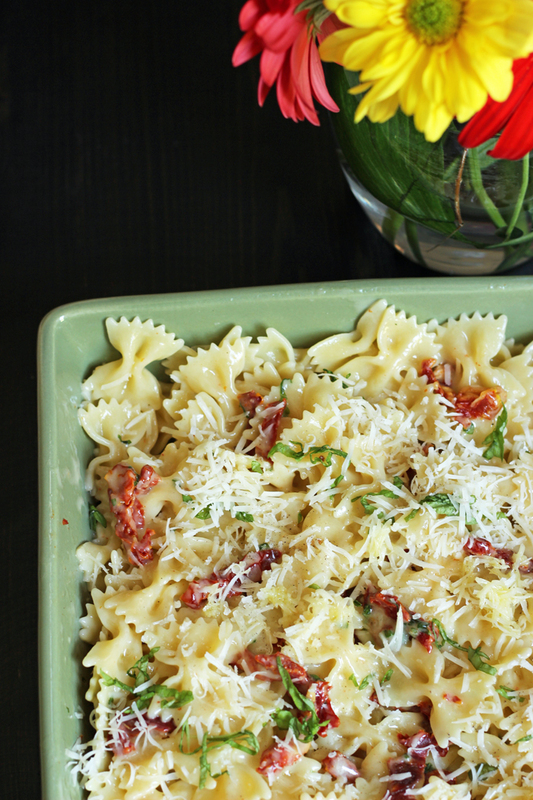 Simple pasta and red sauce gets a fancy makeover when you add vodka, prosciutto and heavy cream. Yum! Several people in my family ask for this on their birthday. Isn’t it funny how pasta is linked to memories! We have some special ones — more than I could fit in the post! In my world, it’s hand over the pesto and no one will get hurt. 🙂 The only thing it doesn’t make better is dessert. Ha! Good to know. I love the one at Costco, so cheap and good.